Is it normal to have people just show up at your door? In my house, it totally is. But yesterday was a weird one. Highly unexpected. Yesterday we had a family friend show up all the way from Cleveland. And he didn’t fly, he drove the twenty-fours from Rocky River, OH to Silverthorne, CO. And all because he got up on Saturday and decided my brother’s 1996 truck needed to get removed from his driveway, so he drove it out. But we are all pretty excited to have him, even if it’s only for a super short time. So when random people show up I make pancakes for lunch and this for dinner. 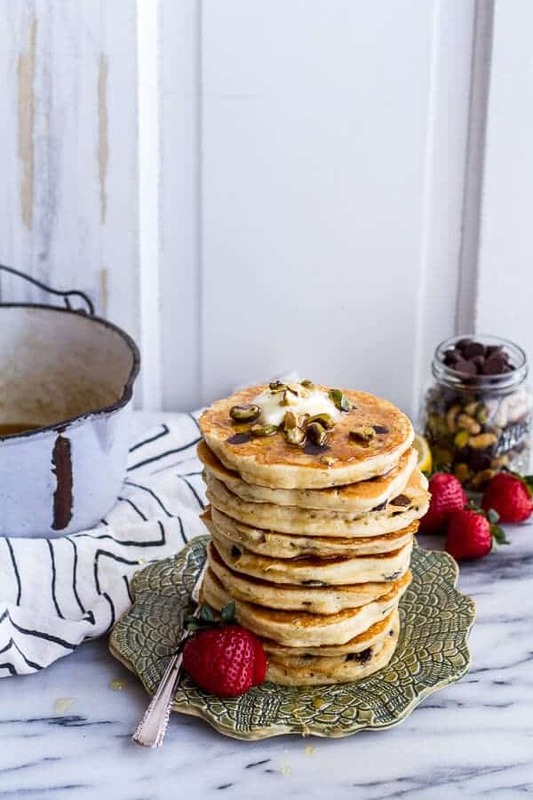 I just kind of feel like pancakes are a good welcoming lunch or I mean breakfast if you are normal, but I really am a pancakes for lunch (or dinner) kind of girl. In all honesty, only mom and I got these pancakes. See, he kind of showed up after the fact and we pretty much wolfed these the second I was done taking photos. We tried to hide what had just gone down, but mom had her signature chocolate lip liner going. She totally gave us away. I mean, come on. You would think after all these years she could get it together already. I of course offered to make more, but he is not really a “sweets” guy. He is actually more of a “Bud” guy. These pancakes came to be because one, I really wanted pancakes and two, I really wanted pancakes with chocolate. What? It’s just a good combo. Since you may be eating these for lunch, I tried to make them a little heartier than sweet. But while they are whole grain, they are still pretty sweet thanks to the honey. Ok, that and the mass amounts of dark chocolate chips I added. Don’t worry though, it’s dark chocolate, so we are good to eat mass amounts. Basic math people. I am a genius at it. Oh, and a pat of butter on top is a must for these. Melted butter combined with the honey and chocolate?? 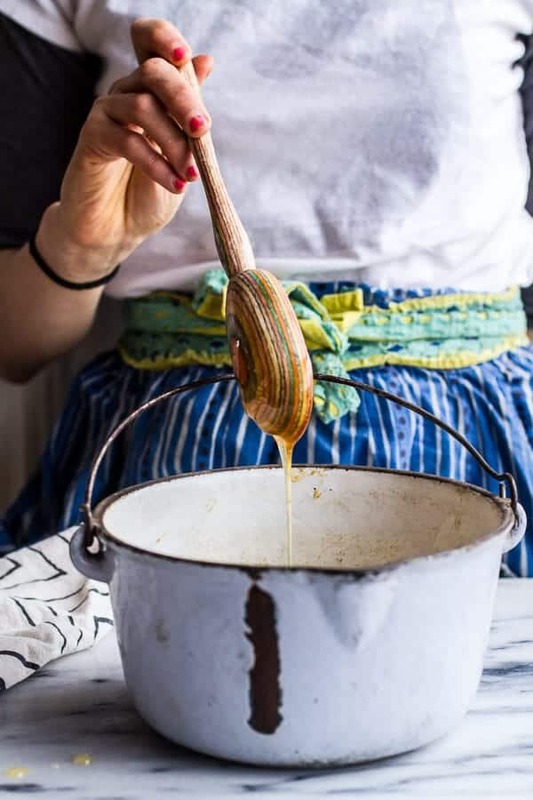 To make the syrup, combine the honey, vanilla, vanilla bean seeds + pods and salt in a small sauce pot gently simmer over low heat for 5-15 minutes. You just want to warm the honey and infuse it with the vanilla. Remove from the heat and set aside (I like to keep it slightly warm). 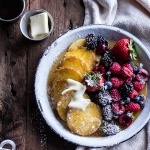 In a large bowl add the buttermilk, eggs, vanilla, melted butter, honey and lemon zest. Whisk to combine. Add the flour, baking powder and salt. Fold the dry ingredients into the wet ingredients until just combined. Gently fold in the nuts and chocolate chips. Allow the batter to sit 10-15 minutes at room temperature. Heat a skillet or griddle over medium heat and grease well with butter or cooking spray. Using a 1/4 cup measure, spoon batter into rounds. 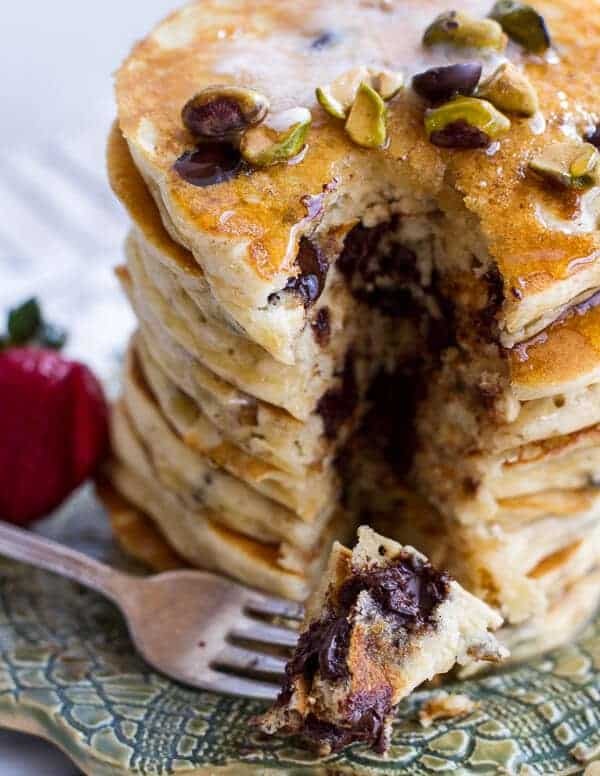 If desired sprinkle a few more nuts + chocolate chips on top of the pancakes (I always do). Cook the pancakes until bubbles form on top, about 2-3 minutes. Flip and cook for another minute or two more. Repeat with remaining batter. 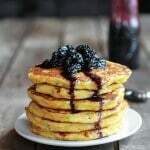 Serve the pancakes warm, with a pat of butter and drizzled with the vanilla honey syrup. Garnish with strawberries and lemon zest. Pancakes on Tuesday? Yup, it’s as fun and awesome as it sounds. I never say no to pancakes. Especially for lunch or dinner and ESPECIALLY with chocolate chips. And that salted honey vanilla syrup? Imma swim in it. Pinned! These look soooo good especially since I haven’t had breakfast. Thanks so much, Charlotte! Hope you had a great breakfast! These look so fluffy! Love the vanilla honey syrup–such a good idea. I made pancakes this weekend too, but just went the normal route and topped them with fresh strawberries. I have to say, nothing beats a good pancake! ooh loving the baklava spin on these! I wouldn’t be sharing that stack with any one! 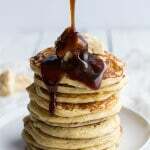 I’m siting here with my coffee and my mouth is watering so bad for these pancakes! But I must know where you got that spoon – it’s divine! Thanks for finding it for me! I got mine at sur la table a few years ago. Thanks so much, Kathy! I got the spoon at sur la table a few years back. Thanks so much!! Hope you had a great day! These look so amaze! Could I sub out regular flour for a GF blend? I would think so, but I am not sure of the texture. They might be a bit more grainy and dense. Hope it works out well! Ha! So fun. I NEVER have people show up at my door, but I’d like to!! 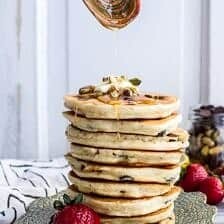 These pancakes would be so yummy for a guest! Really? I will trade you a few of mine guest! HA! Awesome! I love baklava and now I can have it for breakfast!! Thank you so much!! Happy Tuesday! I love fun, surprise guests! 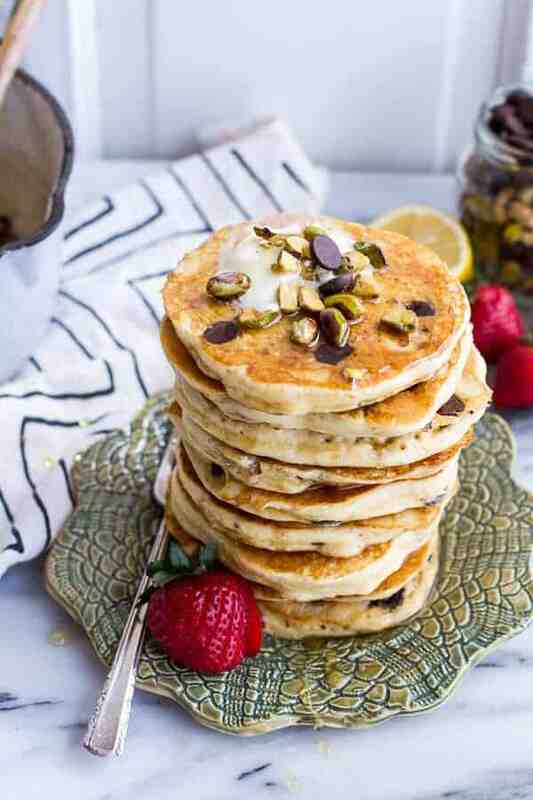 These pancakes look magical! Thanks so much!! They are so good. But it’s the melty chocolate! 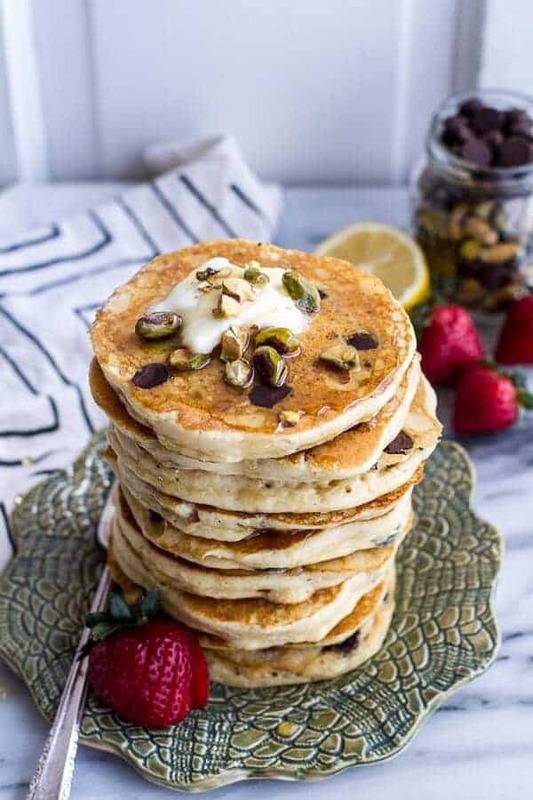 What a fun twist on pancakes! I just bought a waffle maker and I wonder if you could modify the recipe for some waffles! I might have to try 🙂 Loving your apron too! Thanks so much! The apron is from anthropologie! your styling and creativity just gets more and more impressive Tieghan!! 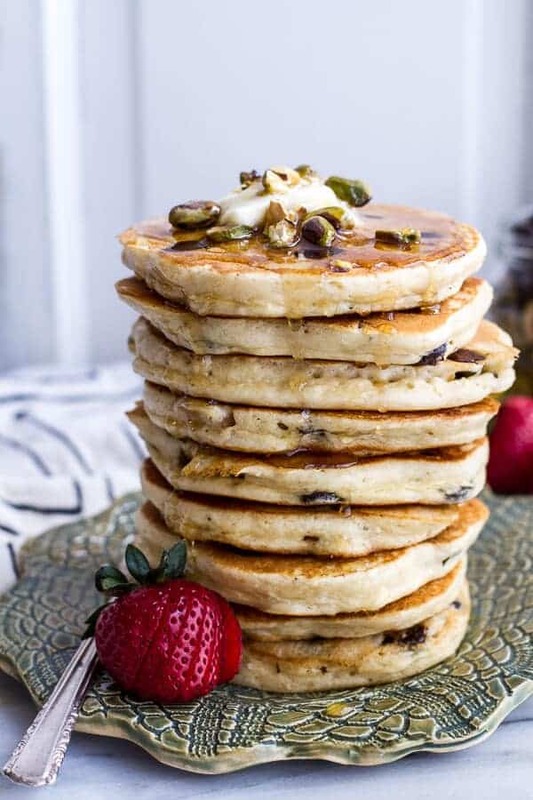 baklava + pancakes? 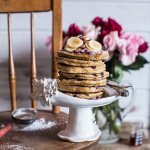 now that is one seriously beautiful stack! YES, YES, YES! Sounds amazing! Plus pistachios are my FAVE! Pistachios are my fav too!! Thanks Sophia! How fun to get an unexpected visitor from Cleveland. I’m sure he loved these pancakes – they look awesome! Also, I love that pot your dad found – so cool! Pinning! 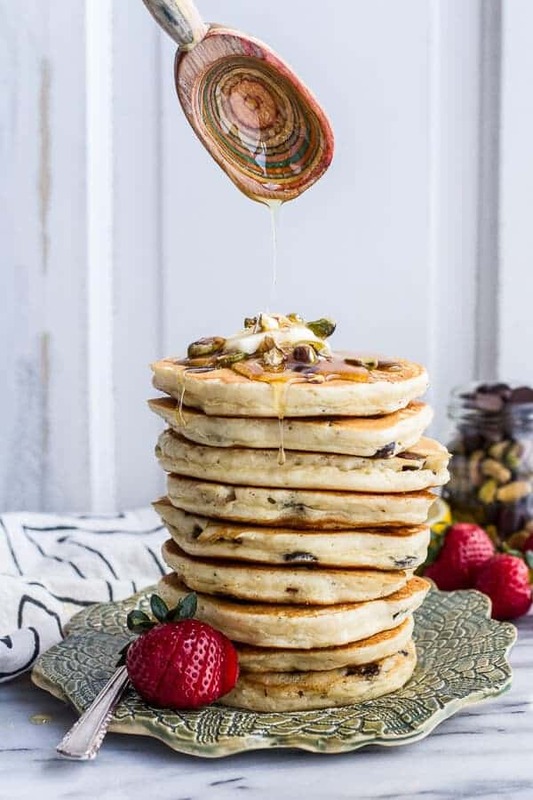 Oh my gosh you are speaking my language—baklava pancakes?! Two of my very favorite things in all the land! Thanks so much, Rachel!! It is quickly becoming on of my favorites too! These look like they’d send me into a sugar coma, but it’d be so, so worth it! They look fantastic 🙂 Ah, the chocolate lip liner…I know it too well (and it has given me away many times). 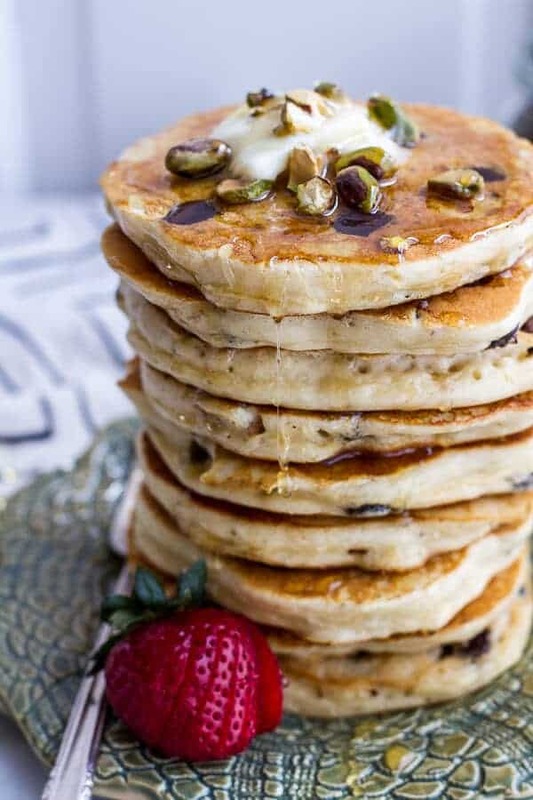 Why are these baklava pancakes? Because you’re throwing some nuts and honey on top? Your recipes really reflect your inexperience and lack of finesse. Mostly you just seem to throw as many things together as possible that have no concordance or harmony. 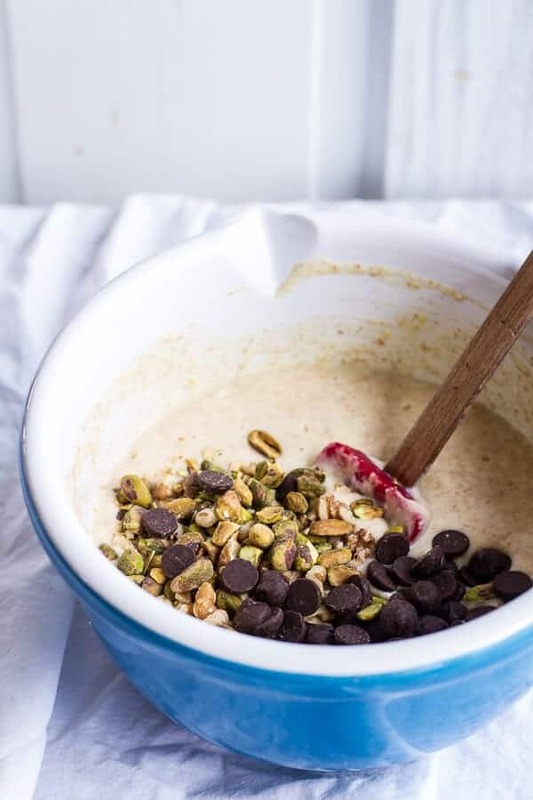 Nice photographs don’t rectify your immature approach to food and recipe development…. What Becca said. You’re the best Tieghan and it’s obvious you work hard at it and love what you do. I’ve been cooking for more than 50 years and I learn things from you all the time. Inexperience my aXX. Pointing out someone’s flaws doesn’t make someone jealous. Most of the negative comments don’t see the light of day on this site, so I do have to give props to Tieghan for including that one. I am so a pancakes for dinner girl! Love these, they look so fluffy and the flavors are perfection! what an amazing combo! im going to make baklava on the blog soon! this has been inspiring.. maybe i’ll add some chocolate to it? 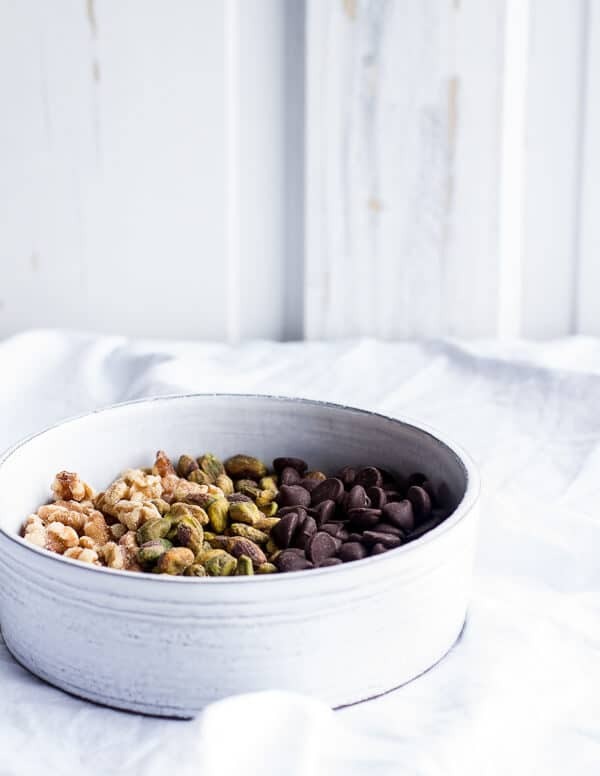 What a beautiful breakfast…love those pistachios! WHAT THE?? Seriously- those look amazing! Your photos are gorgeous! These look AMAZING! Yum. Wow! That is a long way to drive to just “drop in,” but at least you fed him right! it is! Thanks and have a great weekend! Delicious! 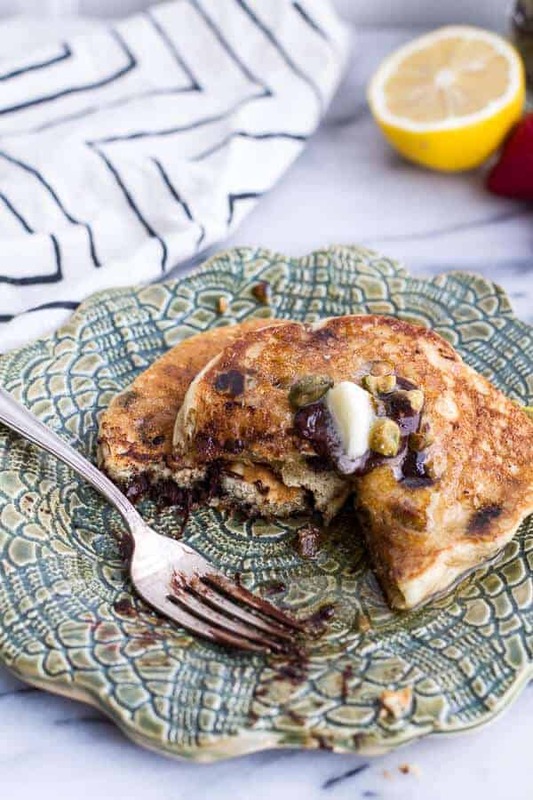 Used egg whites, almond milk and 1/3 cup dark chocolate chips and the pancakes were fluffy and flavorful. Loved the nuts and the addition of the fresh strawberries! Compliments to you for this recipe!! By the way, the wooden spoon in your photos is insanely beautiful! Where did you get it? The spoon is from sur la table.